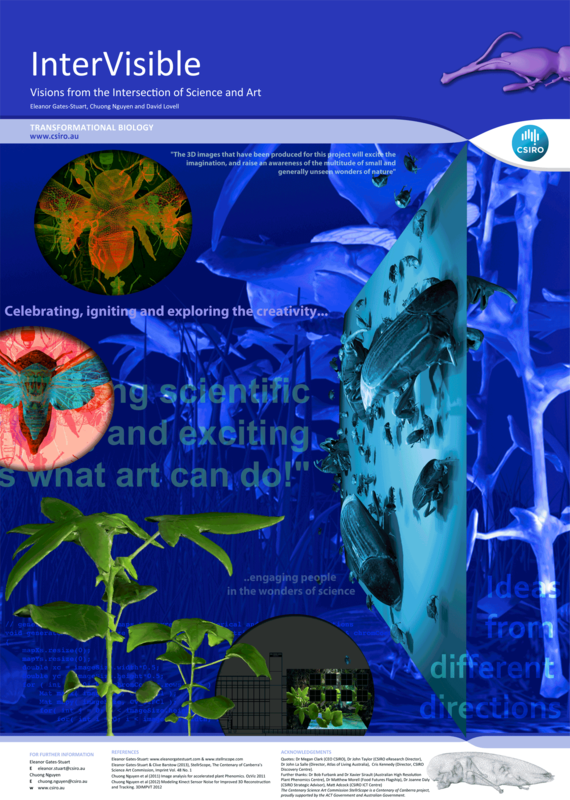 In this project, a unique collaboration between a scientist and an artist has unified scientific and creative research interests in visualising insects from the Australian National Insect Collection. This intersection of science and art, within the fields of computational informatics, material science and entomology has provided a creative catalyst for imagination, ideas and innovation, particularly through the technical and aesthetic processes in which scientist and artist collaborate. In general, science art collaborations are conducted in order to create an artwork which has elements of science within the work. However, this project used art to illuminate the science for the purposes of research. Vision from the Intersections of Science and Art: Gates-Stuart, Nguyen and Lovell. The results of this science and art partnership, including the resultant challenges and benefits for a large interdisciplinary research organisation and for nationally exhibited artworks. The project evolved through StellrScope at the Commonwealth Scientific and Industrial Research Organisation (CSIRO), during the investigation of risk to wheat crops, the wheat weevil in particular. Video: X-ray phase-contrast imaging, cross-section of a wheat weevil. Completed for project StellrScope with support from CSIRO. Dr Eleanor Gates-Stuart in collaboration with Dr Sherry Mayo and Dr Chuong Nguyen – Science and Art Commission, Centenary of Canberra. 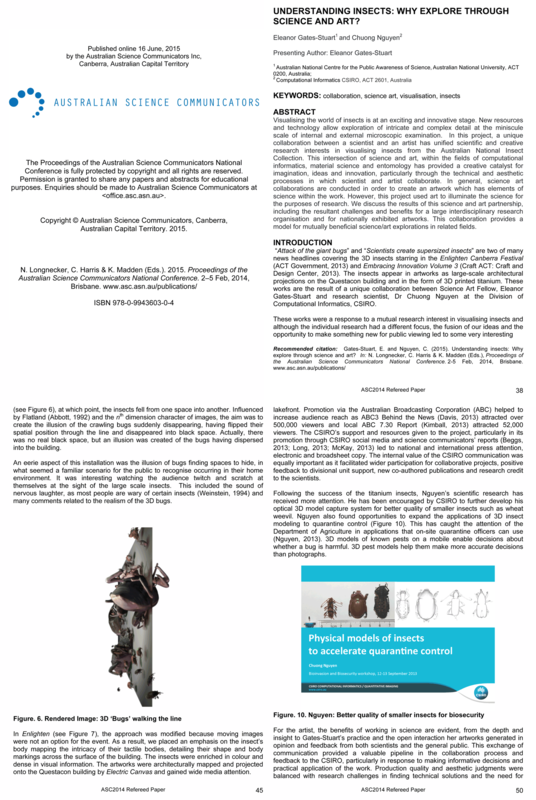 Publication: Gates-Stuart E and Nyugen C: ‘Understanding Insects: Why Explore Through Science And Art?, Australian Science Communicators Conference, ASC 2014, Brisbane, pages 38-52. Download: Proceedings of the Australian Science Communicators National Conference 2014. N. Longnecker, C. Harris & K. Madden (Eds.). 2015. Virtual ‘Grassland’ completed for project StellrScope with support from CSIRO. Grasslands was created for deconstructing scenes for other works to be used in architectural projection and 3D printing.The ‘Grassland’ sequence is an animated scene of 3D objects, insects and plants relating to research at CSIRO. The insects refer to the construction of 3D virtual insects for the Australian National Insect Collection, Dr Eleanor Gates-Stuart in collaboration with Dr Chuong Nguyen – Science and Art Centenary of Canberra. ‘Bugs in Black Space’: Experimenting with virtual skeletons in 3D insect models to create an illusion of movement. The aim was to create the illusion of the crawling bugs suddenly disappearing, having flipped their spatial position through the line and disappearing into black space. Screened as architectural projection and research study for Enlighten Canberra Architectural projections. Dr Eleanor Gates-Stuart in collaboration with Dr Chuong Nguyen – Science and Art Centenary of Canberra. ‘In the Mix’ by Dr Eleanor Gates-Stuart. Part of the StellrScope Series in the ACT Government Legislative Assembly Collection. *Wheat and Weevil scanning by Dr Sherry Maya and Dr Chuong Nguyen.